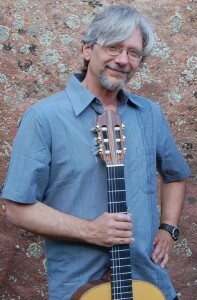 Falling Mountain Music is home to all of the musical endeavors of guitarist and composer Michael DeLalla. Here you can learn more about his concerts, recordings, workshops & clinics, live streaming webcasts, touring, publishing...the list continues to grow as the world changes in the ways we all produce and consume music. Amidst these changes Falling Mountain’s mission remains the same since its founding in 1991—to deliver the rich spectrum of Michael’s music to discerning listeners worldwide. Michael believes in the synergy between performer and audience, the two-way exchange of energy that makes each performance special. In concert, Michael connects with his audiences as if they were family. That dynamic continues between shows, as Michael stays connected to his fans and friends via social networking, building a sense of shared history, present and future. That synergy is what he means by Making Music Matter. Live performances, from concert halls to house concerts to webcasts. Recorded music, from traditional studio projects on compact disc to live recordings done in real time, to digital downloads. Radio, video, podcasts, and blogs to your iPod. Lessons and clinics both face to face and via the ‘net. Through an ever-evolving world our goal will always be to draw as direct a connection as we can between the music and you. We value that synergy enough to make that possible in all the ways you enjoy Michael’s music. The Mindful Guitarist will cause you to rethink so many things you thought you knew about music. It’s not just a method book for classical and fingerstyle guitarists, but a profound look at Creative Process. Visit the Buy Music page to order your copy. Available in book form and all of the major ebook platforms. Guitarists tend to think of their instrument in terms of learning frets, fingers and strings. But there is a whole other dimension of expression that can happen when we think of the right hand differently. One of my most popular workshops. I often say I’m a musician first; guitar is only the voice through which the music speaks. What is the Creative Process? How do we find a voice of expression without getting bogged down in technique? How do we learn to transcend the instrument? What is Creative Listening? A workshop for all musicians (guitarists, “fret” not: you will learn plenty about our instrument as well!). The target participants for this Active Listening Workshop: Adults with a mix of musical backgrounds, ranging from no experience with performing music to amateur or semi-professional performer. Many people think of Improvisation as some mysterious skill that happens “over the chord progression”. We’ll look at it a little differently in this workshop for all musicians. “This Is How I Disappear” is more than the title of the new CD–it’s a journey into an intensely personal creative process. I talk about “disappearing” as a creative necessity, and “reappearing” as its logical outcome, all exemplified by music from my newest collection. 7:30 PM, May 17, 2019 – Boulder CO: The Flatirons Guitar Trio: "Guitar Conversations"
3:00 PM, June 23, 2019 – Capon Springs WV: Capon Springs and 4-day Residential Guitar Workshop "We're All Beginners, Every Day"